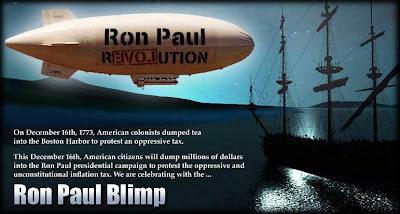 Some wacky Ron Paul supporters thought it would be a good idea to get him a blimp. All they needed to do was raise $350,000 to rent the blimp for a month. They were at around $25,000 when I first stumbled on it a week or so ago. I sure hope they're able to collect on enough of those pledges. It's got to be about the best campaign gimmick ever. It's not often that we get a chance to vote for someone who might actually make a difference. Vote "NO" to the status quo, and give 'till it hurts. That money won't be worth anything in a couple years anyway. Fascinating thing from the Daily Telegraph. Click on the link, follow the instructions, and report back. Apparently I'm pretty right headed. I tried to focus and make her change direction, but couldn't make it work. Then I remembered studies that were discussed in a philosophy class I took twenty-something years ago wherein it was learned the brain may process information differently depending on which eye sees is. I think the experiment involved something like showing one eye a picture of a chicken and the other a shovel, then when asked what they say, they'd say chicken but point to the shovel. Something like that, anyway. Then the left brain, being in charge of language, would make up a lie about why the right brain was pointing at the shovel (to shovel up the chicken poop, or something). Something like that, anyway. So I thought to myself that if I close one eye, maybe she'll spin the other way. But my eyes weren't that easily fooled. Still clockwise regardless of which eye I closed. But then I looked away from the computer and when I did, I thought I saw something funny out of the corner of my eye. And sure enough I did. I repeated the experiment, and as soon as I'd turned my head far enough that the image passed from the field of view of my left eye, she changed directions. But the even odder thing was that although no matter how hard I tried I couldn't get her to change directions while watching with both eyes, when she was turning counter-clockwise, it was easy to think her into turning clockwise again. Brains sure are funny things. This picture was taken on Monday. The vet gave him two to six months. He took a few more. When I let him out on Sunday, he lay down in the back yard and had a look in his eyes that said "I'm never getting up again." There was a scene in Little Big Man where Old Lodge Skins (Chief Dan George) says "It is a good day to die" and lies down in the to die, but nothing happens. "Sometimes the magic works; sometimes it doesn't." And eventually he got up and came in the house. But I knew it was time, and on Monday I called the vet and made an appointment for Tuesday afternoon. I took the day off work on Tuesday. Tuesday was a very long day. He hadn't been eating much for the past couple weeks, and he hadn't eaten anything since Friday. But that didn't stop him from throwing up whatever was left in his stomach, nor did the fact that nothing was left in his stomach stop him. And it was strangely vocalized; it was a human sort of sound that I've never heard from a dog before. On Sunday, I tried to pick him up and bring him into the house. 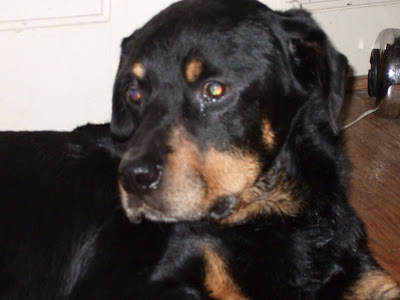 He growled at me like he'd never growled at me before, and I put him down and let him be until he was ready to come in on his own. On Tuesday, when it was time, he didn't seem to care anymore. He didn't react at all when the vet stuck the needle in. It has been reported that on January 8th, Mitt Romney raised just over $3.1 million. That was the single biggest day for any Republican candidate in 2008, and the largest online haul for any candidate ever. Today, Ron Paul, an unserious candidate relying entirely on spam contributions from geeks, nerds, and hackers, all of whom live in their parents' basements, beat that record by a substantial margin. As of 9:00 p.m., EST, he's a bit over $3.3 million for the day. While Hillary Clinton reportedly holds the all-time record for single day find raising with $6.something million, Mr. Paul has the distinction with raising his money without the benefit of questionable fundraisers like Mr. Hsu. I wonder how Sean Hannity, Rush Limbaugh, and the rest of the MSM will explain this away.